Digital amplification enables cost-saving power efficiency and supports smaller, more compact designs-obvious benefits for today's home lifestyles. However, at Onkyo, we believe that these benefits should not come at the expense of the most important consideration: sound quality. 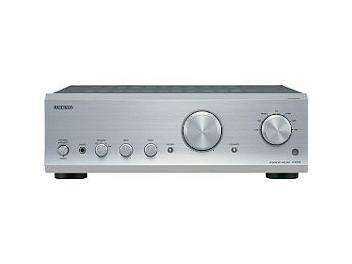 With the A-9555 integrated digital amplifier, sound quality takes precedence over all else. Thanks to Onkyo's exclusive VL (Vector Linear) Digital technology, which removes any spike noise before it can introduce errors into the inversion timing, highly accurate analog-to-digital conversion becomes possible. Also, at the heart of the A-9555 is a Pure Stream Power Supply-essentially a large power transformer-that ensures that you always have on-demand power for the clarity and detail of a range of musical genres. Integrating the fundamentals of sound reproduction with the potential of digital amplification, the A-9555 is an audio revelation.